Special clinical interest in breast, urological, lung, prostate brachytherapy, haematology and lymphoma. Dr Yaw Chin is a Radiation Oncoligist with over 10 years’ experience in the treatment of cancer. 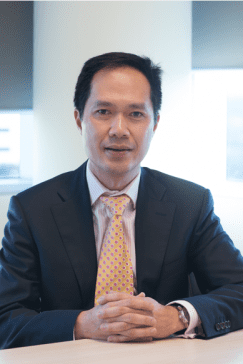 Dr Chin has a keen interest in the management and research of breast and prostate cancers. He is actively involved in clinical trial development and recruitment. Dr. Yaw Chin graduated from medical school in 1997 and obtained his fellowship in Radiation Oncology in 2004. He was selected as the Windeyer Fellow of the RANZ College of Radiologists from 2004-06 where he undertook specific training in prostate brachytherapy at the Mount Vernon Cancer Centre in North London. In 2014, he then returned to Sydney to work at St. George Hospital Cancer Care Centre as a staff specialist. He also assumes the position of Director of Training at St. George Hospital and is a Phase 1 examiner for the Faculty of Radiation Oncology (RANZ). He has published in several national and international peer-reviewed journals and obtained his Masters of Public Health from the University of NSW in 2010.